As a follow up to my post from last week regarding the condemnation we may feel, at times, when we look through Organizing Magazines, I’d like to take the next step — using Organizing Containers. Last week I talked about the steps of purging before you go out and purchase organizing containers because you might be buying containers that aren’t needed. After you have purged, you may have removed a great deal of your clutter and your need for containers is limited. So let’s say you’ve done your purging and now you need to “contain” the remainder of the items you have decided to keep. Clutter usually comes because you don’t have a clear place for your items. They get left on the floor, in a closet, on a tabletop and the piles begin again. This is where containers are needed. Whether you choose baskets, boxes, bins or totes does not really matter. As long as you put like with like and containerize them. Leaving them on a tabletop or on the floor should not be an option. How do you decide what type of container to purchase? That’s really your preference. Are you a basket person? Going to Longaberger.com and stocking up on those baskets will truly make your room beautiful … but it will come with an expense. Michael’s Crafts, as well as Hobby Lobby, have many type baskets at more reasonable price. These stores can provide you with various types of organizing products to meet your every need. When you purchase a container, remember it could have many uses. You could buy a small plastic container and find uses it in every room of the house. Let’s take this container from The Container Store. It is being sold as a desk organizer. But it really has many uses. So you see containers can be versatile with many uses for one item. So as you organize different rooms of your house, don’t toss an organizing container away until you are completely done with all your projects. You never know how one container used in one room can now meet your need in another room or area. If you struggle still with trying to make decisions about what type of container to use, call a Professional Organizing Expert. We are here to meet your needs! I especially like containers that match. Often we have mismatched ones and it looks more disorganized. When we match a colorful, cute container to the space, it adds pop. 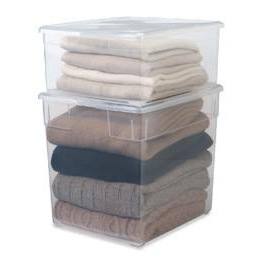 I also like uniform clear containers. It also adds to the look of organization.